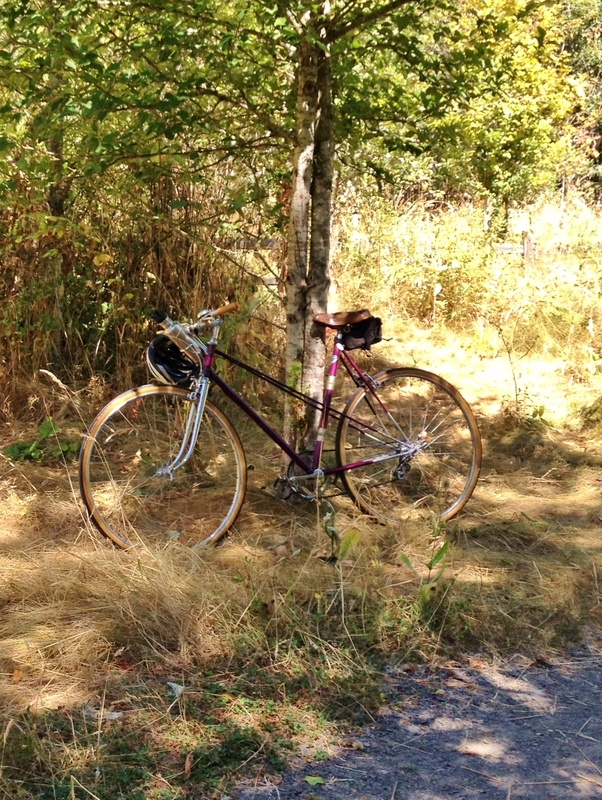 I decided to take the 1953 French Mystery Mixte out for its first test ride today. I headed over to Sellwood so I could start the Springwater trail from Sellwood Park, and avoid downtown traffic. 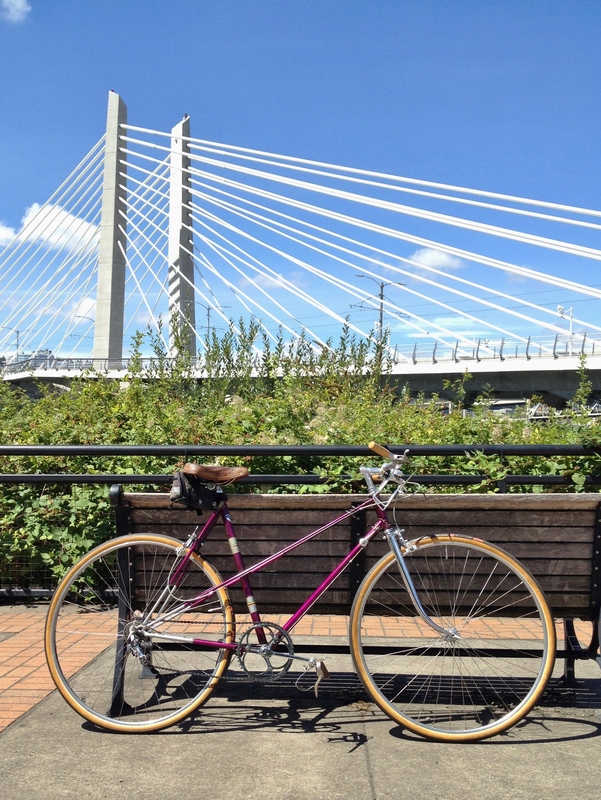 This year, Summer riding in Portland has been a mixed bag. It has been easy to be beckoned by the dry weather, but the recent heat waves and high humidity have made it challenging to enjoy even my regular commute. Although cool and breezy, today was more humid than I expected, so my single water bottle turned out to be inadequate. 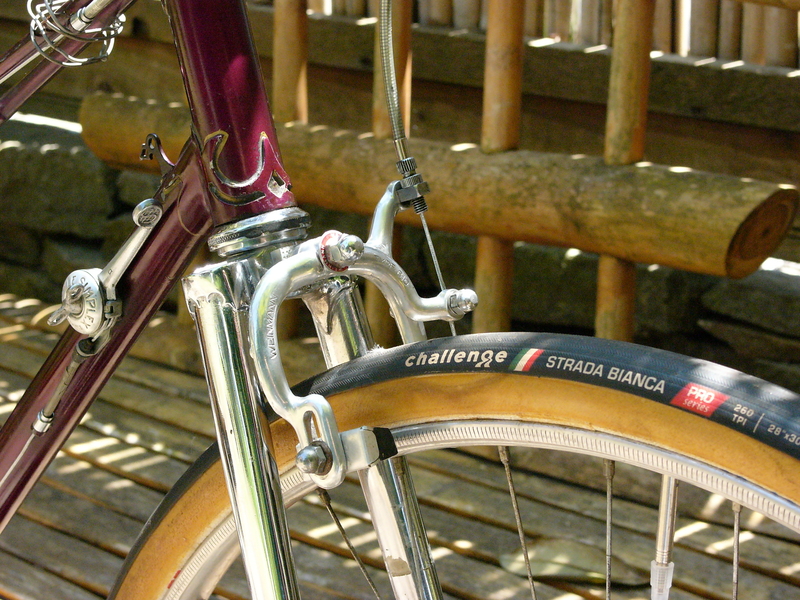 I was anxious to see how the Challenge Strada Bianca tubular tires felt. I even wondered if somehow the ride would be transformed by the legendary smoothness and purported supple sidewalls of tubular tires. I was brought back to reality worrying that I might get a flat. But, one upside to tubular tires is not having to carry a spare tube, patches, or tire irons. I can’t imagine what it was like to actually have to carry an entire spare tire (or two, plus glue and a sewing kit). So, I didn’t even bother with a pump, and just stuffed a few tools and my cell phone into a tiny seat bag. As I got underway, I felt like I was riding an e-bike. Wait. 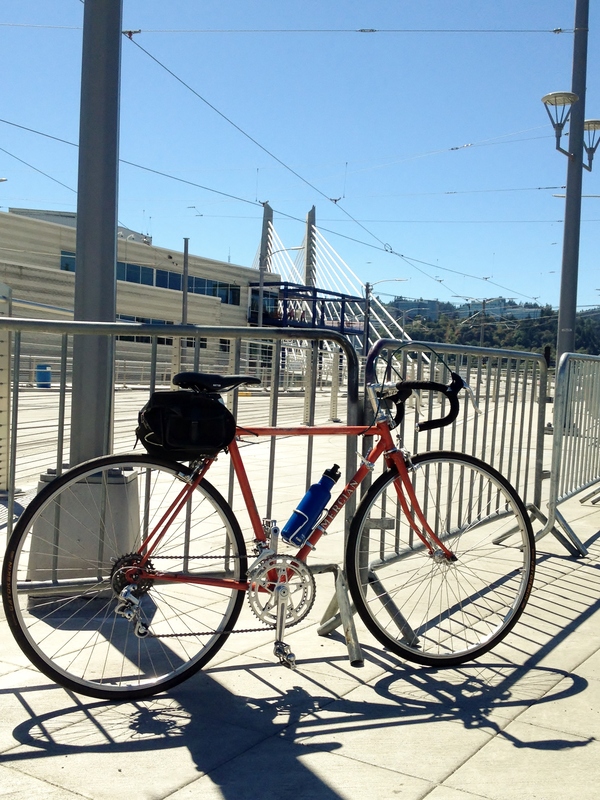 The bike is long and tall, and I was in a fairly upright position with the city style bars. Yet I was positively rolling! Could it be the tubular tires? Well, it turned out to be a tailwind, which I discovered when I reversed direction to head back to my starting point on the trail. After this moment of elation, I concentrated on what the bike was telling me as I sped along, passing nearly everyone: responsive frame, comfortable saddle, smooth-as-glass hubs, easy shifting, and no lateral flex (thanks to the twin sloping top tubes of this mixte frame). The tires felt fast, yet more comfortable than similar 30mm width tires that I have ridden, and handled the brief time I spent on hard packed dirt when I took a detour with no mishaps. The gearing is very high, and even moderate hills required a standing position to maintain cadence. 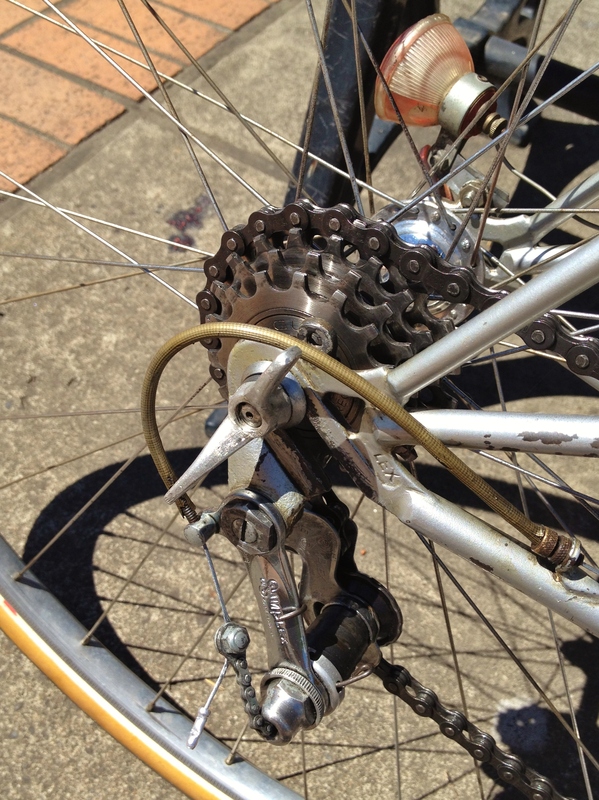 I ended up not using the highest gear, and rode the bike as a three speed. 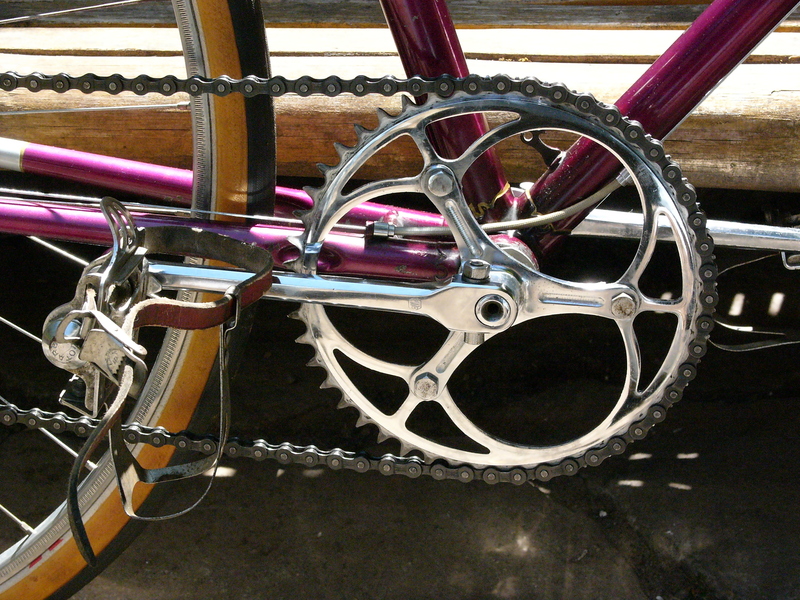 Fortunately, the Simplex Tour de France derailleur can handle up to a 24 tooth cog, which means that the gearing could be lowered from its current 59-83 gear inch range, down to a low gear of 52. That would help make this bike more versatile. Even so, hill climbing will remain challenging. A tubular tire oddity is that they lose pressure very quickly. They will lose several pounds overnight, and a lot of air after a week. That’s one reason you’ll see bikes with tubular tires kept elevated, so that no flat spots or creases develop in the sidewalls. For this outing, I had inflated the tires the night before with about 85 lbs in the rear tire and 75 lbs in the front, but as I was riding I felt sure that I had lost pressure especially in the rear tire. In the future I will plan to inflate the tires before each ride – which is a good practice anyway. 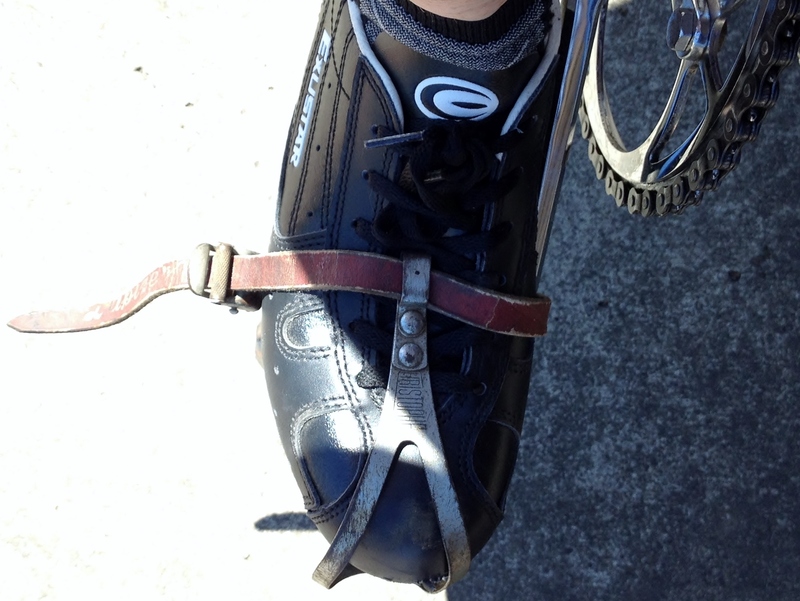 I enjoyed using the old Lyotard Marcel Berthet pedals with their original clips and straps. I hadn’t rebuilt them yet, and even so they performed just fine for this short trip, and were easy to get my shoe in and out of. The narrow braking surface of the Clement rims is imprinted with a pattern, theoretically to improve braking. In practice, the rims emitted a high pitched whining sound whenever the brakes were applied. While the noise did alert others to my presence, I want to find a way to make braking silent, so will be experimenting with some different brake pads. I also still have friction in the rear brake cable, which I need to troubleshoot. Yesterday, I had taken the 1972 Mercian out for a spin, so it was interesting comparing the riding experience of these two different bicycles. The Mercian is a classic 1970’s road bike, using 700c tires on a small frame which happens to fit me perfectly. It has a 100cm wheelbase, but similar (and higher than I prefer) wheel flop and trail numbers (wheel flop 17 and trail 59). I was not disappointed in the handling of the mixte. I did not have any trouble maneuvering at slow speeds, whereas the Mercian does exhibit the unwieldy feel of a high wheel flop bike when riding at slow speeds. The long 109cm wheelbase helps to keep the bike feeling more stable than it otherwise would. Both bikes are comfortable yet performance oriented, and versatile enough for any kind of riding, with the right gearing. Neither bike has rack mounts, but both have fender eyelets. With a saddlebag support, either bike could be put into daily service as a commuter, and the Mixte’s high gearing and light 22 lb weight could allow it to do double duty as a training bike. 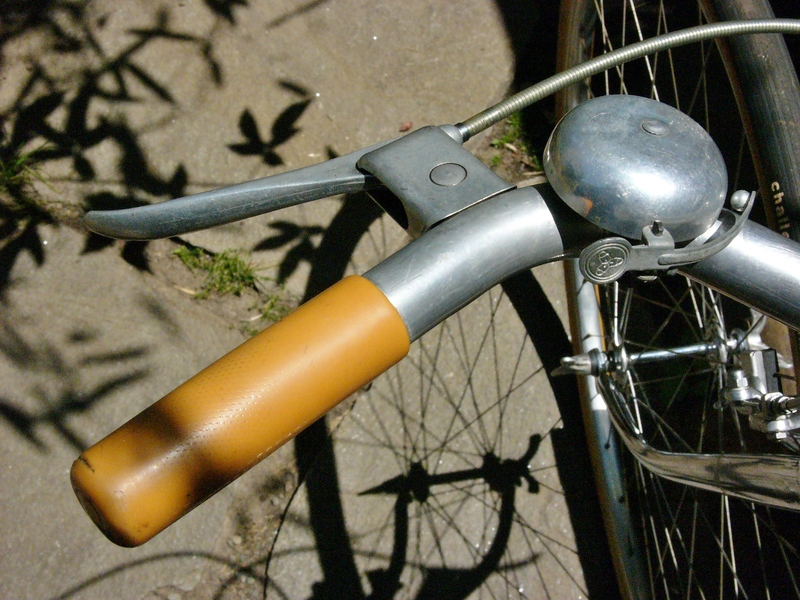 The city style bars have flush mounted levers, which although stylish-looking, means that the only way to adjust the position of the levers, is to adjust the handlebars. My wrists and hands were uncomfortable after a while, because they were not in a neutral position, so I’ll be making adjustments to the bars as well as completing a few other minor tweaks. The bike’s first ride left me impressed. Riding it today reminded me again of how well the cycling industry had developed by the end of WWII. Its high end components and beautiful Oscar Egg lugs translate into a well-appointed, lightweight bicycle that is perfectly competent and comfortable to ride. I am looking forward to riding it again. This entry was posted in Bicycle restoration, constructeur, French bicycle, Ladies Vintage Bicycle, Mixte bicycle, Oscar Egg, Simplex Tour de France, Vintage bicycle restoration, Vintage French Bicycle and tagged bicycle frame geometry, bicycle restoration, Clement rims, Oscar Egg lugs, tubular tires, vintage french bicycle by Nola Wilken. Bookmark the permalink.